/Company Intranet /How to Use Survey Module in Mangoapps? Surveys enable you to design a set of questions which then allows you to conduct HR surveys, measure job satisfaction and get employee feedback to drive up engagement. 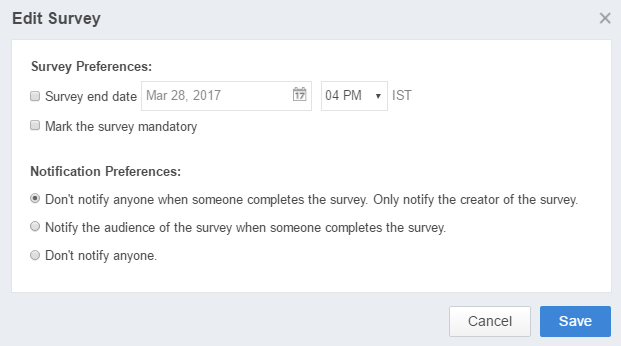 Where is Survey module available in MangoApps? The survey is available as a module in Social Intranet, Team Collaboration & All in One Suite offering of MangoApps. Who can create a survey? Surveys can be created by any network user or only by team and domain admins based on the setting in the admin portal. Can the survey be time-based? Yes, the creator of the survey can put an end date to the survey. How can you create a Survey? You can also select from a set of list pre-defined survey templates available in MangoApps. Pick your Audience – You can pick your audience of Specific Users, Your Followers, Team or Everyone. (Note: Everyone as an option is available only when you are Network or Company admin). You can also use people selector to select users. Message to show on completion of the survey – You can configure a message to show on completion of the survey. Who can take a survey? Surveys can be asked of your followers, your teams or a specific group of users. Additionally domain & company admins can create it for everyone in the company. Guest users get access to the surveys enabled in the projects/groups they are part of. When a user is added to the target audience after the survey was created but while it is open, they can also take the survey. If you close a survey in between, then you can resume it later. Already answered questions would not be populated when you continue the survey. Note: You can take a survey yourself even as the creator your opinion also matters. Additionally, for testing, you can send the survey to a test audience before making it available to actual users taking the survey. Testing Audience helps to remove any error or discrepancy in the survey. Can the survey be re-taken? No, Once you have completed a survey, you can’t take the same survey again. The creator of the survey, the team, and the domain admins can view insights from surveys. Please note the user need’s to take the survey before viewing insights if they were also the intended audience for the survey. Do I get points for answering or creating a survey? If levels and badges are turned on for your domain, you will receive points for creating or answering a survey. Only, we won’t tell you how exactly to get them (Because where’s the fun in that? ), so keep taking more surveys to get more points and badges! Can I clone a survey? Yes, you can clone a survey. This will address the need of having the same survey for a different target audience. Can I make changes to an existing survey? Yes, you can make changes to an already published survey by editing the survey. For an already published survey, you can only change the ‘Survey Preference’ & ‘Notification Preference.’ The content of a published survey cannot be changed. For a survey under draft mode, you can change both ‘Content of the survey’ & ‘Audience & Notification Preference. Where can I see all my completed surveys? Under the surveys tab, you can choose the filter ‘Surveys I have Taken’ to see all surveys that have you have taken. Yes, you can delete a survey. Once deleted it can be restored from Trash Can under admin portal. How can I disable surveys for my company? As an admin, you can turn off the surveys app under the modules tab.